The animal puppets start simple but get complex, so come back every day for a new virtual toy! And if you would like to learn about how I made these and how you can make your own toys, check out the GitHub project page. You can also see the Director's Commentary I made on my development blog. 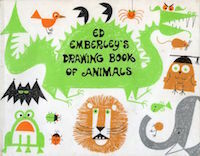 If you'd like to learn how to draw these animals, and many more, buy the book! It's terrific for kids and grownups to learn on their own or together.